Children near the barrier on Soar Road. The River Soar is on the other side of the railings. The railings have since been replaced by a substantial wall to alleviate flooding. The boy on the bike is Terry Stirling. 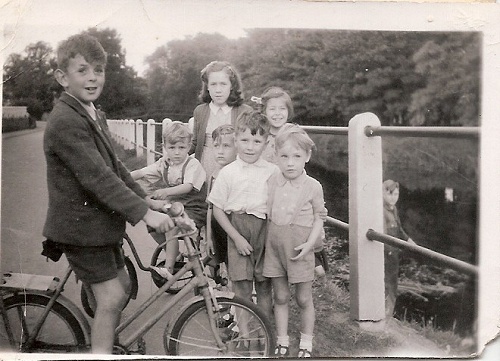 The taller of the girls is Eileen Harrold and the girl with the bow in her hair is Sylvia Marshall. The photo is taken opposite the bottom of Freehold Street by the river. I lived in Freehold street for a while, having been evacuated from Birmingham during the bombing to live with my granny and grandpa Hannah and Frank Rue. Missing information: Can you identify any of the other children in this photograph? Submitted by: Unknown. Updated by Christine Cox (nee Baum).